Since this video was made, our church has many more paintings and iconographies added to the church walls. The Orthodox Church believes that God is the Creator of heaven and earth. The Creator is present through His creative energies of His handiwork. This means that the material world, being valuable and good, is an important means through which God expresses Himself. Designed to create an atmosphere which is special, the building is filled with a feeling of joy and an appreciation of God's bounty. Orthodoxy recognizes that beauty is an important dimension of human life. Through iconography and church appointments, the beauty of creation becomes a very important means of praising God. The divine gifts of the material world are shaped and fashioned by human hands into an expression of beauty which glorifies the Creator. As the pious woman poured her most precious oil on the feet of Our Lord, Orthodoxy seeks always to offer to God what is best and most beautiful. 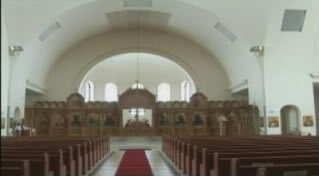 The interior church is most importantly, both the background and the setting for Orthodox worship. The art and architecture are designed to contribute to the total experience of worship, which involves one's intellect, feelings, and senses. The Eucharist and the other sacramental mysteries take place in God's midst, and they bear witness to His presence and actions. Therefore, in the Orthodox tradition there is a very strong feeling that the church is the House of God and the place where His glory dwells. 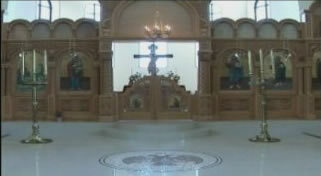 For this reason, all Orthodox churches are blessed, consecrated and set aside as sacred space. 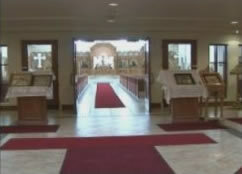 The sanctuary is considered the most sacred part of the church, and the area reserved for the clergy and their assistant. The sanctuary contains the Holy Altar and is separated from the nave by the Iconostasion. This division serves to remind us that God's reign is not complete and that we often find ourselves 'separated' from God, through sin. However, during the Divine Liturgy, when we have access to the Holy Gifts, we are reminded that, through Christ, heaven and earth are united and that through Him, we have access to the Father. 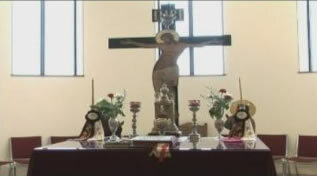 It should be noted that not all services take place within the sanctuary. Many are celebrated in the center of the nave, in the midst of the congregation. In so doing, Orthodoxy emphasizes the fact that the worship of the Church is offered by, and for all the people.